Unwrap a daily festive gift or reward! 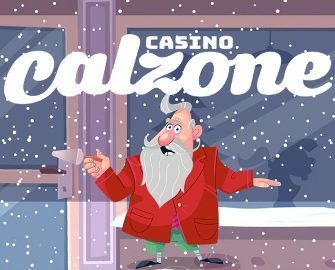 Cal’s second Christmas bash in his very own casino is heading into its second week and the gifts keep getting better. He has put up a daily calendar with all sorts of goodies we casino players love to get our hands one during the festive period. Log-in every day to find out what Cal has waiting for you. 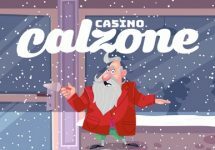 Yet another awesome Christmas campaign has kicked off at Casino Calzone, promising great fun and rewards for the festive season. Cal has prepared a Christmas Calendar with an abundance of daily offers, complete freebies and more. Plenty of action for everyone to scoop up some superb prizes. Bonus terms and conditions apply, read them carefully. Make a deposit of minimum €30 today and get instantly a €5 bonus cash chip. Wagering requirements are 35x within seven days with a maximum withdrawal capped at €5,000. Deposit €20 or more and you’ll be entered into the raffle for one cash prize of €250. The raffle winner’s account will be credited in cash by 18:00 CET on 10th December 2018. The winning player will be informed by SMS on the same day as the payout. Deposit minimum €50 to instantly receive 50 bonus spins on Fairytale Legends: Hansel and Gretel. Offer can be claimed up to three times. Spins have a wagering condition of 35x within 7 days and have a maximum withdrawal capped at €1,000. Deposit minimum €10 and place a single bet of minimum €20 on any live table from Evolution Gaming to instantly receive a €2 bonus. The Cash Chip has a wagering condition of 35x within seven days and has a max win of €5000. Deposit minimum €40 to instantly receive 12 mega spins on Secrets of Christmas. Spins have a wagering condition of 35x within 7 days and have a maximum withdrawal capped at €1,000. Deposit minimum €10 to receive a 25% deposit bonus, up to €100. Wagering requirement is 25x deposit + bonus within 7 days days. Maximum withdrawals are capped at €5,000. Launched in May 2017, the casino is operated by MT SecureTrade Ltd. under MGA Malta and UKGC licenses. On offer are a large variety of games on desktop, mobile and tablet from Netent, Big Time Gaming, Blueprint Gaming, ELK Studios, igaming2go, JustForTheWin, Lightning Box, Microgaming, NextGen Gaming, NYX Interactive, Play’n GO, Pragmatic Play, Quickspin, Scientific Games, Thunderkick and Yggdrasil. The Live Casino tables are powered by Netent Live and Evolution Gaming.